Hurricane Earl was a long-lived tropical cyclone that became the fifth named storm of the 2010 Tropical Season. Earl developed from a tropical wave west of the Cape Verde islands on August 25, quickly strengthened to a tropical storm, and then became a hurricane on August 29 near the Lesser Antilles. Earl became a major hurricane on August 30 as it moved past the Leeward Islands. After a temporary weakening trend, the storm quickly reorganized and reached its peak intensity of 145 mph (Category 4) on September 2, coupled with a minimum barometric pressure of 927 mb (27.37 inches/mercury) as it moved east of the Bahamas and well east of Florida. 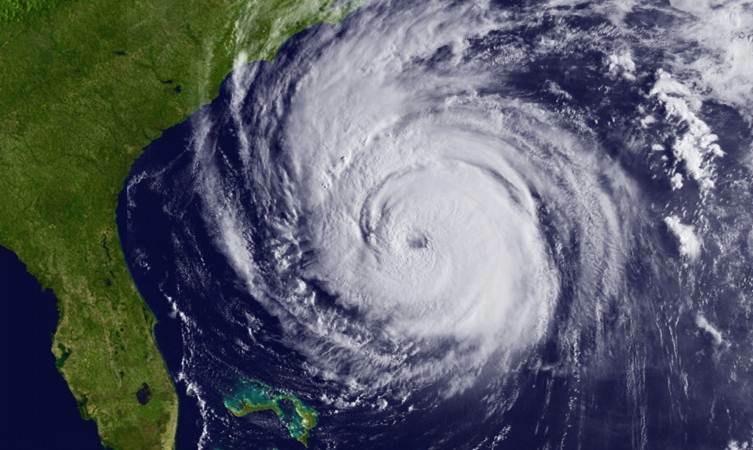 As the storm started to curve more to the north and northeast, it slowly weakened over cooler sea surface temperatures and passed about 85 miles east of Cape Hatteras during the morning of Friday September 3, 2010. Earl then accelerated northeastward making landfall over Nova Scotia as a category one hurricane (Figure 1). Damage estimated at over $40 million occurred in the Leeward Islands with one fatality. In North Carolina, only moderate damage occurred over the Outer Banks, with damage estimates of about $3.8 million. No fatalities were reported in North Carolina as the result of Earl. Figure 1. Track of Hurricane Earl, August 25 through September 6, 2010. The storm passed about 85 miles east of Cape Hatteras. Figure 2. Category 4 Hurricane East as it passes east of the Bahamas and Florida on September 2, 2010. Figure 3. 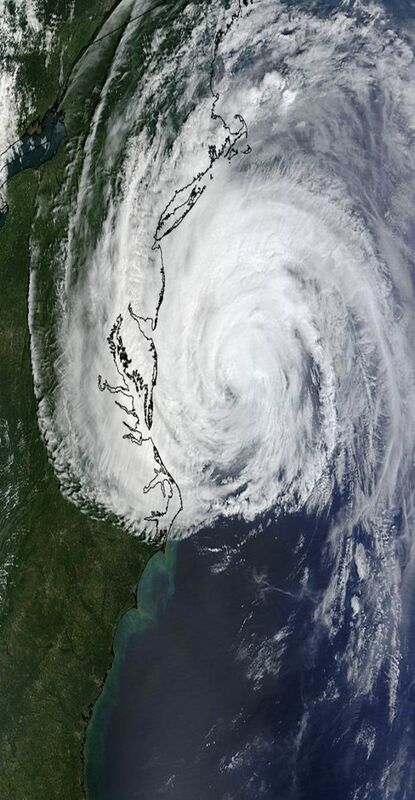 NASA satellite image of Hurricane Earl passing northeast of the Outer Banks on September 3, 2010. Hurricane Earl was the second major hurricane of the 2010 Atlantic Season, following Danielle, a system that only affected shipping interests out at sea. Earl passed through the Northern Leeward Islands, Virgin Islands and Puerto Rico on Monday August 31, 2010. The storm's worst effects were over St. Kitts, St. Maarten, the British Virgin Islands, and Anguilla where an 88 MPH measured wind gust occurred before the wind instrument malfunctioned. Earl downed numerous trees and power lines with some minor structural damage noted. As Earl traversed the open Atlantic Ocean waters northeast of the Bahamas, Hurricane warnings were issued for Eastern North Carolina and the Outer Banks with Tropical Storm Watches and Warnings to the north and south of North Carolina. The center of Hurricane Earl passed roughly 85 mph east of the Cape Hatteras (Figures 4 and 5). 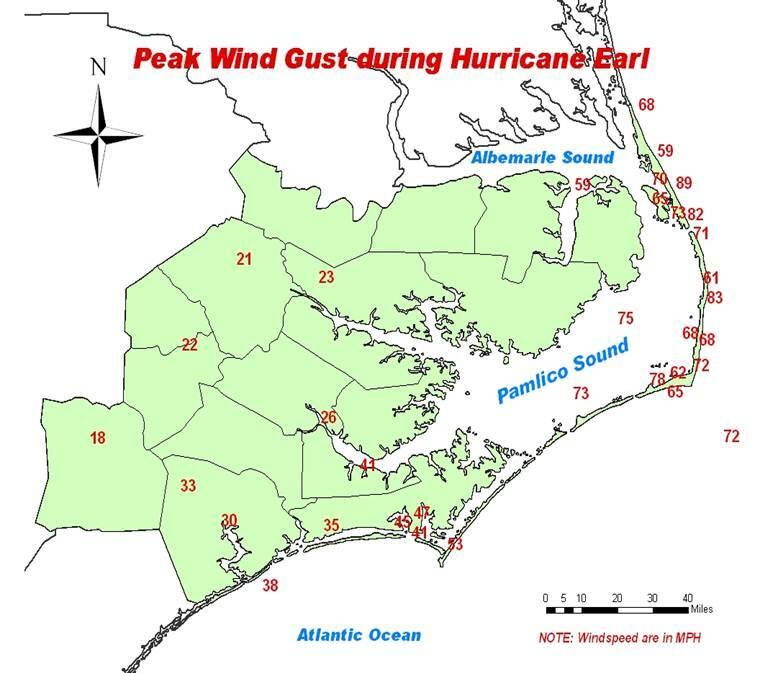 Earl’s large size brought a significant storm surge to the Outer Banks, along with hurricane-force winds. The highest winds were record at Buxton with sustained winds of 67 mph and gusts to 83 mph. A storm surge of nearly 5 feet inundated areas around Hatteras Island, shutting down Highway 12. 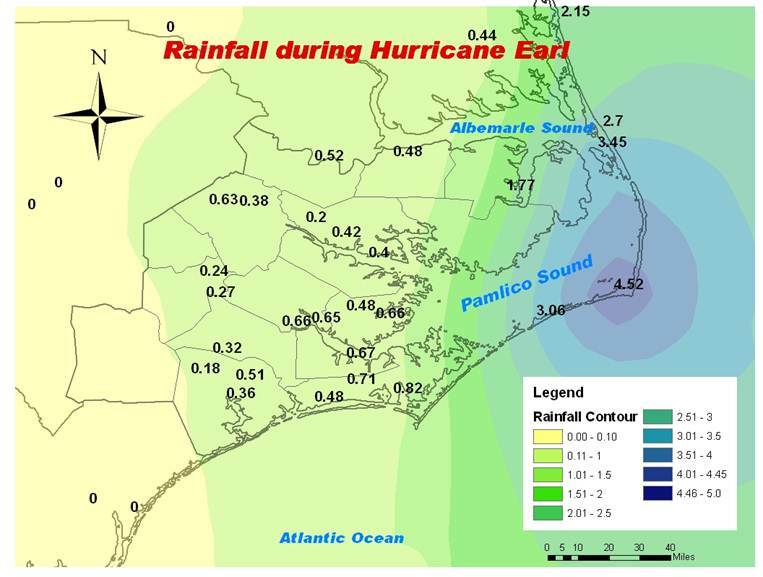 Heavy rains also accompanied the storm with 4.5 inches measured in Cape Hatteras. Numerous homes around Hatteras Island were flooded by rising waters. Despite the large area of hurricane force winds, wind damage was moderate, with mostly homes losing shingles and minor damage to businesses along the Outer Banks and around Manteo. Damage in Dare County totaled $500,000, with 79 houses sustaining minor damage and another six receiving major damage, mainly due to storm surge. In Hyde County, strong winds caused about 2 million dollars in crop damage, and some fallen trees in the Swanquarter and Fairfield areas. Maps of sustained wind (Figure 6) and rainfall amounts (Figure 7) are included below. Figure 4. 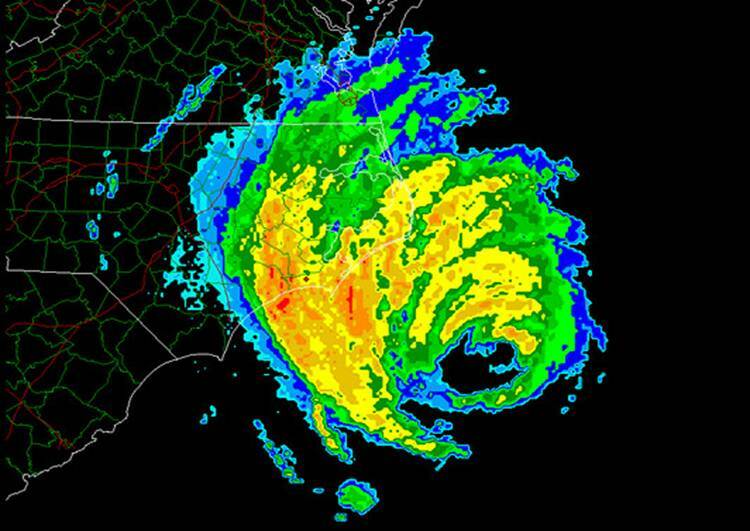 Radar image of Hurricane Earl as it passes east of the North Carolina coast early in the morning of September 3, 2010. Figure 5. 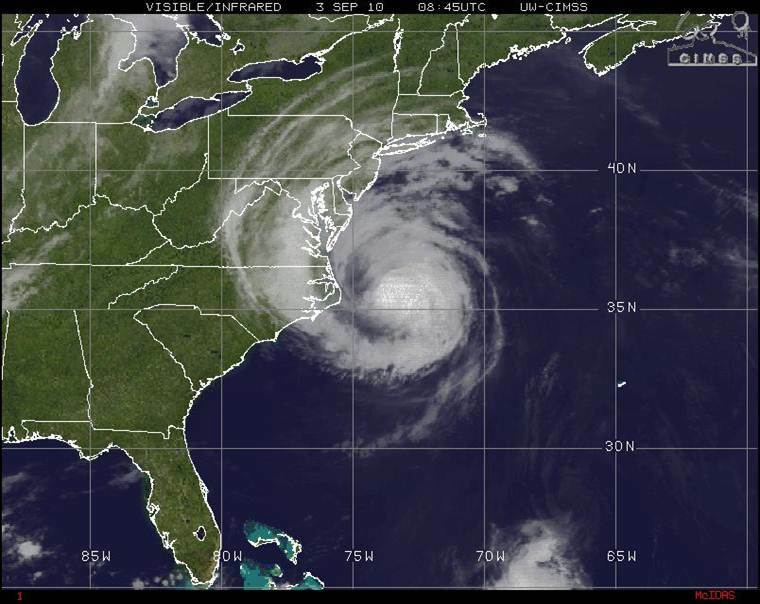 Satellite image of Hurricane Earl passing east of the Outer Banks around 5 am September 3, 2010.